Give your wine collection the showcase it deserves with the all-new YHWR305-1SRT Single-Zone Wine Cellar Refrigerator! For true wine lovers with large and diverse collections, the sheer volume of bottles that can be stored and the versatility of the adjustable shelves are must have features. With other exciting attributes like the easy-to-use digital temperature display and controls, beautiful cool blue LED lighting, activated charcoal filter and fan forced cooling, your new cellar is sure to be the talk of your next party. 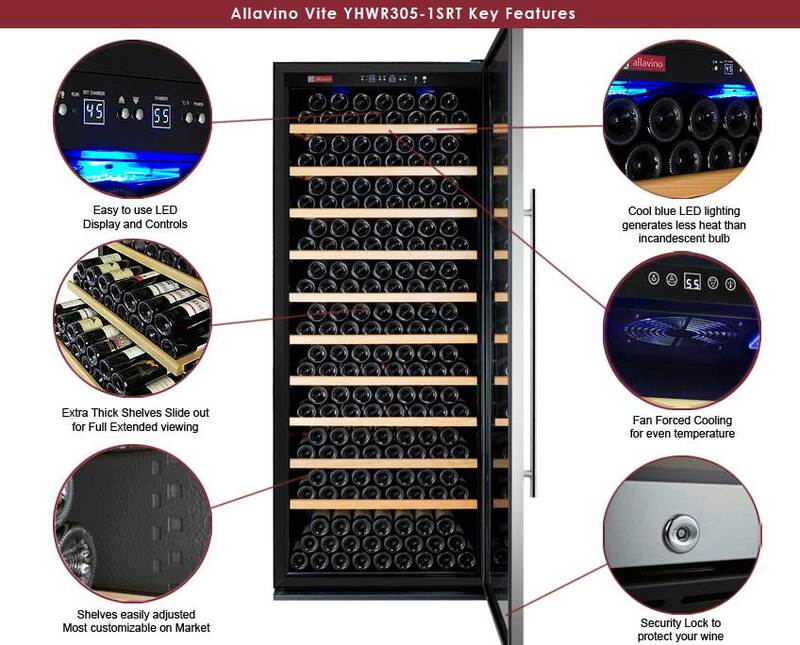 The Allavino YHWR305-1SRT features digital temperature display with push button controls that make controlling the wine environment easier than ever. It has a temperature range of 41°F to 72°F, allowing you to set it low enough to store white wine at serving temperature, or high enough for long term storage of red wine, depending on the needs of your collection. You can easily monitor the lighted temperature display through the glass without having to open the door. Each of the extra thick hardwood shelves can support the weight of up to 28 regular size bottles with standard spacing, and the bottom shelf can hold larger magnum bottles or up to 25 standard bottles, for a maximum capacity of 305 bottles. 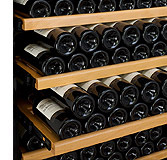 The shelves glide-out on ball-bearing tracks that allow you to reach every bottle in your collection with ease. The racks are adjustable in 1 1/4" increments to accommodate larger bottles, so you are not limited in the types of bottles you can store. Storage of larger diameter bottles will affect your overall bottle capacity. An internal fan circulates air in the unit for additional cooling, helping to prevent large differences in temperature between the upper and lower shelves and reducing initial cool down time by 50%. The air circulation creates a frost-free environment so you will not have to worry about defrosting the cabinet. Cool blue LED lighting beautifully illuminates the interior, making finding the perfect bottle fast and easy. The lights emit much less heat than an incandescent bulb which means they can be left on to showcase your collection without creating a harmful hot spot that could affect your wine bottles. The UV-protected glass is frost and condensation free, keeping harmful light away from your wine while giving you a great view of your collection. The built-in key lock keeps your collection secure for added peace of mind. Two keys are provided, allowing you to have a back up. With the standard racking configuration using bottles no wider than 3", no taller than 8 1/2" at the shoulder and no taller than 11 3/4" overall, you can fit 28 bottles on each sliding shelf along with 25 bottles on the bottom stationary shelf by stacking three rows of bottles toward the back of the rack and placing two more bottles sideways in front of them. Each unit features extra thick hardwood shelves that support the weight of multiple rows of bottles, allowing you to fit more bottles in the space provided. Each of the shelves glide out far enough to access the rear bottles so no bottle is out of reach. With maximum flexibility in mind, the shelves were designed to be adjustable so that collector's with varying bottle sizes would not be limited to the amount of space they have on each rack. You can set them close together to achieve the utmost capacity in the space provided, or you can set them apart to accommodate large diameter bottles. The beautiful wood finish will complement any decor. The Vite Series features internal fans in every model, which helps to prevent large differences in temperature between the upper and lower shelves and reduces initial cool down time by 50%. 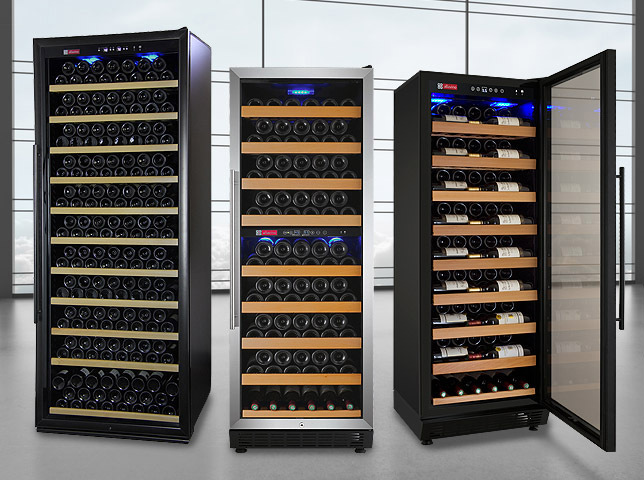 The single zone units feature a temperature range adjustable between 41°F and 73°F, a wider range than most other wine refrigerators on the market, and the dual zone unit allows users to store both red and white wine simultaneously. An active charcoal filter helps keep unwanted odors out of the cabinet. Each unit features digital display with push button controls, high quality thermal insulation on both the cabinet and door, UV protection on the glass to keep harmful light away from your prized possessions and key locking doors to ensure no one touches your collection unless you want them to. With either black or stainless steel doors, towel bar or curved handles, single or dual zone options and capacities ranging from less than 100 to over 300 bottles, you are sure to find a model that fits your style. Comments: Vite Series 305 Bottle Single-Zone Wine Refrigerator - Black Door with Left Hinge: I purchased this unit to replace a Vintage Keeper 220 that was on its 3rd AC unit and finally spit apart at the base from moisture / condensation. This unit fits that space very well. It is noticeably taller and heavier than the old unit. I ended up fabricating a base plate for this unit to avoid floor damage on the Hardwood. I also shimmed and leveled the base plate to make the unit leveling easier. The Good: The unit runs fairly quiet after the compressor initially kicks on. It pulls the temperature down quickly. The design of shelving was geared towards maximizing bottle storage. The shelve adjust-ability is necessary unless you just collect normal thickness Bordeaux glass bottles. It has a nice modern look to it and the door feels more solid than my last cabinet. The shelves are solid and the tracks are ball bearing and sort of lock / snap back into their closed position albeit stiffly. The Bad: The feet on the unit are not easy at all to get access to due to the way the base frame is designed. It was easier for me to lever the front of the unit up and block it, then move the front feet while unloaded and set the unit down again. Once level i encountered problem two; the condenser coil that covers the entire rear of the unit was rattling against the rear panel when the compressor was running. It was extremely annoying. So save the little white foam squares from the shelve centers from shipping. These placed in several spots between the coil and the frame provides an excellent damping for that rattle. Also definitely use some form of strapping on the rear wall to lock this tall heavy unit down. Also there IS a plastic coating on the left and right panels from manufacturing that should be removed to reveal the actual nice black finish of the unit. The Wine Fridge: This unit is actually a fridge with its condenser coil covering the entire rear panel so the recommended 3" air space should be adhered too. There is a small charcoal filter and vent hole that was designed to circulate some fresh air through the unit. Overall i am pleased with the unit. I spoke with customer service on some questions I had before installation and they were extremely helpful. Comments: This is one of the better companies I have ever dealt with. The support staff is off the charts! The only quibble I have is with the standard information sheet that is sent out regarding delivery procedures. We had a white clove installation, but the standard information sheet said our unit would be delivered curb side only. This should be corrected to alleviate any client stress. This company gets my highest recommendation. 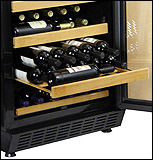 Comments: The wine cooler is quiet, attractive, sturdy and the racks roll smoothly. The 305 bottle capacity is based on standard Bordeaux size bottles, as clearly stated, so capacity goes down with champagne or burgundy shaped bottles. To partially accommodate those odd sizes, the racks can be moved up or down. Overall. for those who have a mix of bottles, probably 200 is a more realistic capacity. Still, it is well priced on a bottle/dollar basis and I'd buy it again. Caveat: this is a free standing unit and can't be used as a built in. Delivery got a bit messed up a the end, but Beverage Factory support was excellent through that tribulation. Comments: The product is nearly as described. Depending on the type of wine bottle the capacity is not 305. The unit is quiet clean and works well I am very satisfied. The delivery service had to be reminded it was white glove delivery. 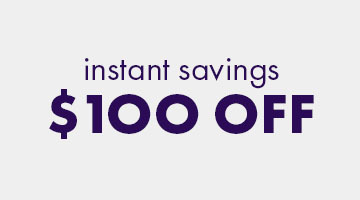 Please note: Free Shipping Includes White Glove Service on this model. The delivery company will bring it inside, unpack it, place it where you want it and remove the packaging materials when done. Please call us at 800.710.9939 if you have questions about what is involved with white glove service.